Try betfair golf trading risk free, your first bet refunded up to £20 if you happen to lose - click here and use promo code VAL222. Alternatively you can claim the normal bet £10 get £30 sportsbook (fixed odds, not exchange) free bet via this link. For more Betfair promotions and free bets in 2016 click here. To read the latest betfair reviews from GBS readers click here. To newcomers, golf trading may seem a little daunting. 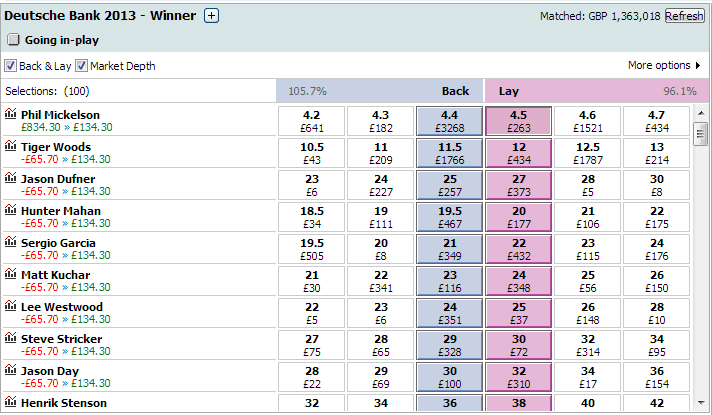 The odds on offer can be huge compared to the mainstream bookies, however with outright markets being 'win only' this feels a little uncomfortable for many golf punters who are used to placing an each-way bet on their weekly fancies, safe in the knowledge that they'll get a decent return even if their player finishes 5th. 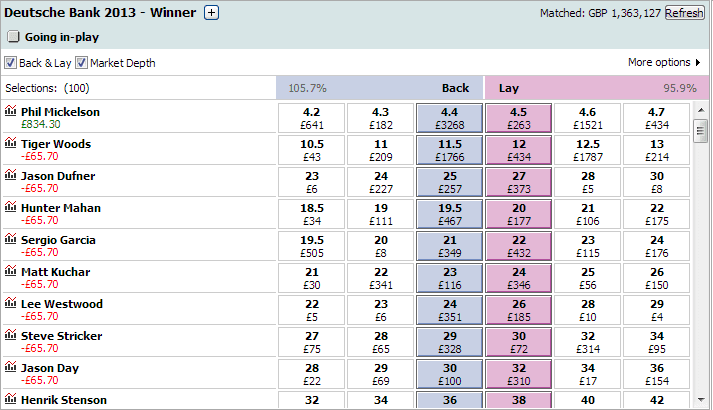 So how can we simplify golf trading so that it can be a useful part of your betting strategy? Read on! At the end of the first day Lefty had shot a fabulous 8-under par round of 63 and was now the clear favourite. Trading at 4.4 - the equivalent of just short of 7/2 in old money - this presents us with options to trade out now and secure a profit and create an all-green screen. One option at this stage is to trade your overall stake so that you're effectively betting for free for the remainder of the tournament. By offering your £65.70 stake at 4.5 (the lay price) you can instantly create a scenario where you've got a no lose bet: If Mickelson wins you get a reduced £604.35 back; if anyone else wins then you've lost nothing. Of course by doing this you are reducing your overall potential winning total on Mickelson, however this takes the risk out of the bet completely and is a popular golf trading option. Betfair allow you to try different lay amounts and prices before placing the trade so you can see the potential impact to your profit before committing to the bet. 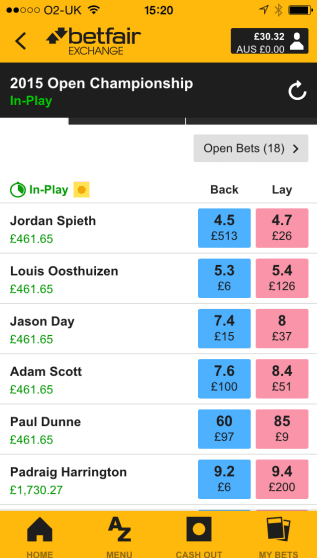 These examples are the two extremes of your trade - you could choose to lay anywhere between the £65.70 and £200 which would then give you different levels of potential profit on Mickelson and the other players. 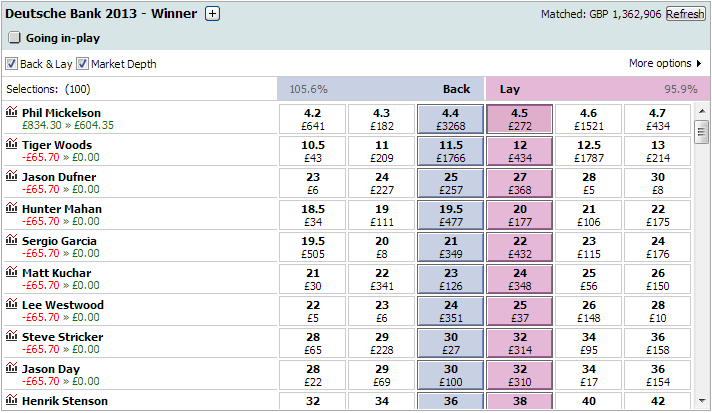 By selecting the 'take £200' option betfair will automatically complete the trade for you, which certainly makes it easier for novices and when time is of the essence. There are many ways to play your trades and sticking as close to the action as it unfolds is critical if you're going to maximise your positions over time. In the end we traded out a large proportion of the Harrington win as soon as he'd birdied the 5th hole on Sunday, just before he found the gorse off the tee which resulted in a double-bogey and effectively took him out of the reckoning. 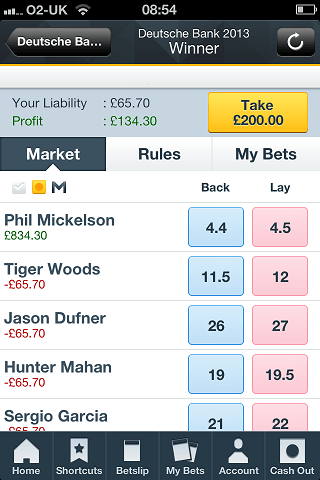 Our main example featured Phil Mickelson who faded after the first round and eventually finished 41st - other than picking him for first round leader or first round 2-balls, the only other way to have profited on Lefty that week would have been to trade him on betfair. There are plenty of opportunities to make a profit throughout every golf tournament as the prices on players can fluctuate massively from hole-to-hole: understanding when players are reaching scoreable/tough parts of a course and placing a trade accordingly can be a great golf trading strategy - assuming you're right of course! There's no substitute though to picking the right players on the right week, so ultimately doing your research and understanding which players are more likely to perform well is essential. Keep reading our previews and stats pages here at golf betting system, follow us on twitter and join our facebook group to help keep right up to speed. 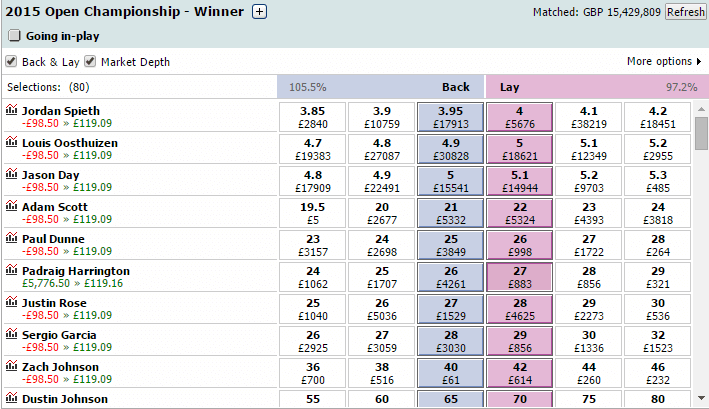 The final consideration is that you'll pay a commission to betfair on every profitable market, so that should also be factored into your calculations. Good luck! Try betfair golf trading risk free, your first bet refunded up to £20 if you lose - click here for details.